Broadwater Post Office is being upgraded to a main style branch. This is part of modernisation programme which is taking place and Broadwater Post Office is one of 8000 branches being upgraded. The Government committed £1.34bn in 2010 towards this venture. What will this mean for Broadwater Post Office Customers? The new-look Post Office is scheduled to open on Tuesday 4th November at 1pm. It will be closing for refurbishment on Saturday 18th October 2014 at 12.30pm. If there are any unforeseen delays, posters will be displayed at the branch. I am delighted that Broadwater Post Office is being upgraded and I hope residents will show patience and understanding during the refurbishment. I cannot believe that I am up for election again in 2014. The last few years have whizzed by and I have witnessed many changes. During my time as a Worthing Borough Councillor, I am honoured to have been offered the role of Policy Advisor to the Leader of Worthing Borough Council, Paul Yallop. I have sat on the Licensing Committee since I was elected and was promoted to Vice-Chairman last year. We have had many difficult decisions to make and I know there will be more to come. I feel this is a worthwhile and rewarding committee and I look forward to many more years. During my time as councillor, I have witnessed the recruitment of two chief executives – Peter Latham and Alex Bailey. I have now met Alex and I am excited about the suggestions he has already made and I look forward to helping Alex put his ideas into action, alongside our leader, Paul Yallop. I have secured S106 money for low ambient lighting in Kitties Field (Dominion Road Recreation Ground). It is wonderful to see children playing outside safely, and now they can do so during the darker winter months. For the past year, we have helped a Broadwater family to deal with a tree which has been causing misery and damage to their property. The tree was protected with a Tree Preservation Order (TPO) and it has been a challenge getting this tree cut back, but it has now been done. 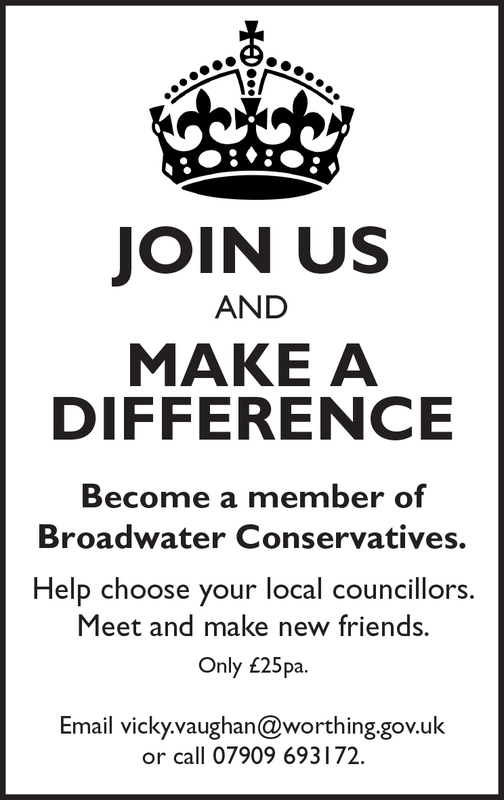 I organised the Broadwater Royal Wedding Picnic in 2011 which raised £1500 for Broadwater Community Association. It was a fantastic event and our MP Tim Loughton, along with Alan Rice and Ann Barlow were gunged for charity. You can see the movie by clicking here. These are just a few of the things I have done. In my next blog you can read about what I am planning to do if I am elected again.